The corniche in the Abu Tig Marina. El Gouna (Arabic: الجونة‎ El Gūna pronounced [elˈɡuːnæ], "the Lagoon") is an Egyptian tourist resort, owned by Samih Sawiris and developed by Orascom Hotels and Development, dating from 1989. It is located on the Red Sea in the Red Sea Governorate of Egypt, 20 kilometres (12 miles) north of Hurghada. It is part of the Red Sea Riviera. El Gouna buildings were designed by many influential European and American Architects to resemble the Traditional Egyptian Architecture like those found in the Countryside and Nubian villages. El Gouna specializes in water-sports, including scuba diving, windsurfing, kitesurfing, waterskiing, parasailing and snorkelling. There are several beaches: including Zeytuna Beach (Arabic: شاطئ زيتونة‎) located on its own island, Mangroovy Beach, Moods Beach and other hotel beaches. A network of canals allows many houses to have their own strip of beach, even hundreds of meters inland. Most of these canals are crossed by small stone bridges. 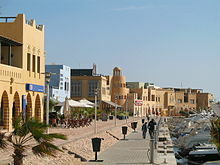 There are three main areas in El Gouna, Downtown, Tamr Henna Square (Arabic: ميدان تمر حنة‎) and the Abu Tig Marina (Arabic: مارينا أبو تيج‎). There are 18 hotels (some of which were designed by the American architect Michael Graves) with 2,895 rooms rated from three star to five stars. In addition to a six-star hotel called La Maison Bleue located next to the Abu Tig Marina Extension. El Gouna hosts a golf course designed by Gene Bates and Fred Couples. A second golf course real estate project, Ancient Sands Golf Resort, designed by acclaimed golf course architect Karl Litten, was opened in 2012. El Gouna has a fully equipped International hospital that can handle many medical treatments including dentistry, plastic surgery, pediatrics, ophthalmology and general surgery. It also features an intensive care unit and a decompression chamber in case of diving accidents. The town hosts the El Gouna International School, a campus of the TU Berlin an Environmental Geographic Information System and a small private airport for charter aircraft. There are also three marinas: Abydos marina, the Abu Tig Marina and the Abu Tig Marina Extension, currently in its last phase of construction, which can receive super yachts. The town also houses a small museum with some 90 exhibits (including statue replicas and an exhibition hall of contemporary Egyptian paintings by Hussein Bikar) which opened in 1996. Other attractions and activities around town include a small aquarium, a go-kart track, a paintball arena, tennis courts, horse stables and a football stadium. The local football team El Gouna FC currently plays in the Egyptian premier league. It also has a Mosque and a Coptic Church, the Church of St. Mary and the Archangels. In 2017 an annual film festival was established, the El Gouna Film Festival, it attracts many Egyptian movies stars, also hosts some International stars as well. The weather in El Gouna is sunny all year long. Temperatures range between 17 °C (63 °F) and 33 °C (91 °F). Humidity is 22% on average. Köppen-Geiger climate classification system classifies its climate as hot desert (BWh). ^ "Orascom Development - Home". Orascom Development. Retrieved 5 November 2016. ^ "El Gouna Tourism: Best of El Gouna, hurghada, Egypt". TripAdvisor. Retrieved 2015-09-17. ^ "El Gouna Film Festival kicks off its first edition in Egypt". English.alarabiya.net. Retrieved 7 October 2018. ^ "Weather in El Gouna". Bookelgouna. Retrieved 2015-09-17. ^ "Climate: El Gouna - Climate graph, Temperature graph, Climate table". Climate-Data.org. Retrieved 18 August 2013. Wikimedia Commons has media related to El Gouna. Wikivoyage has a travel guide for El Gouna. This page was last edited on 6 April 2019, at 22:16 (UTC).